We measured a sampling of these jeans of different waist sizes and lengths and find they are much like other jeans you’d buy these days. They are just a bit “vanity” sized in the waist. Across the size run, the actual measured waist is just about 2” larger than the stated size which is typical vanity sizing. And of course these are denim and may shrink just a tad too. The jeans have pockets in the hips for the addition of the Pro-Shape hip protectors (see link below). The hip armor is quite thin and flexible so I don’t think they’ll make a difference in the size choice of jeans if you choose to wear them. So my overall advice would be to buy the waist size you normally wear in jeans; you’ll likely find a fit. If you aren’t sure whether your jeans are vanity sized like I’m describing, then either measure your waist where your normal jeans ride or measure your favorite pair of jeans to verify. You’ll probably find that you measure out a bit bigger than your normal jeans size and also the waist of your favorite jeans measures out an inch or two bigger than their stated size. If so, you will be on track following my advice. The inseam lengths measured out to be generous. In the smaller jeans, the inseam of about 33”, the mid-sized jeans were about 34.5” and the larger jeans topped out at about 36”. Again, the jeans will probably shrink a bit, but even so, these inseam measurements are generous. The pant legs are a simple design and could be hemmed. These Dainese D1 Evo jeans are a sharp mid-weight jean that comes with complete with removable knee armor and pockets for hip armor. The fabric is reinforced with Ar0mid to make them more abrasion resistant. The overall fit of these jeans is quite average… not skinny and not baggy. The legs taper to a straight cut. the fly and waist close with buttons. They are a lower waist cut jean too. I think they are slim fit enough to look sharp , but you don’t have to be a skinny-winnie to wear them either. The armor installed in the knee pocket is the very thin flexible Pro-shape armor. Many jeans use this type of armor. Its think and of course isn’t going to be as impact protective as thicker armor, but with a jean, most people don’t want armor that show through the fabric, so than regard, this stuff is perfect. There are pockets at the hip that will accept matching hip armor. Just take the link below to purchase. If you look at these pants on the inside, you can see the yellow Aramid woven into the denim and there is a strip of Kevlar fabric in the seat. 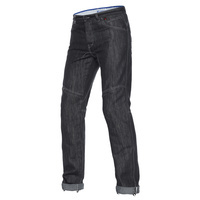 Dainese says: Ideal for urban or sports use, D1 EVO jeans follow your every movement on the saddle. A weave of aramid fibres and high quality cotton make the D1 Evo fabric protective and resistant but still soft and comfortable thanks to a special stone wash treatment. These Made in Italy jeans feature certified zip-fastened removable height adjustable Pro-Shape protectors at the knees and internal DuPont™ KEVLAR® fibre mesh reinforcements. These jeans can be fitted with Pro-Shape protectors at the sides, feature reflective inserts and can be worn with gaiters which pass under the feet.